There are some people you meet who you will automatically label as confident. 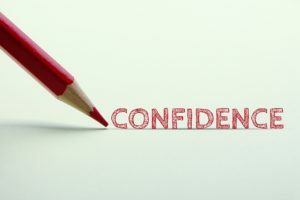 They look confident on the outside and ooze confidence with all that they do, but I can assure you that they may not be confident in all aspects of their lives. Take me for example, many people who meet me will say that I am confident, and I am to a point. Give me a microphone and an audience and I am loving life but ask me to do something like drive a car in France (which I did A LOT when I lived there and which I appreciate is an odd example) and I lose my confidence completely – it is like a barrier goes up and it won’t come down and the reason is because I am no longer getting the experience in this area. Dress – what you wear really can change how confident you feel about yourself so getting this right is essential. If you look good and feel happy people will see that confidence coming through you. And don’t forget the small things, for example, chipped nail varnish is a no no as are dirty shoes! Eye contact – I am a huge promoter of positive eye contact. If you can happily look someone in the eye, smile and say hello, even if you want the world to open up and swallow you, you are steps ahead of people who cannot do this. You don’t have to speak, you simply have to look someone in the eye. In my experience of walking through the corridors of many businesses, there are not many people who can do this – they are the ones I don’t remember – is that the impression they were hoping to give? The ones I remember are the ones who can look me in the eye and smile. These are the ones that give me an impression of confidence. The more we can promote the positives the more confident we will appear to the people we meet. So, to feel more confident it is important to put yourself out there and to do the things that do not always come naturally to you. The more you do, the more experience you will gain and the more confident you will become. And don’t forget that while you are practicing, consider what you are wearing, your body language and your eye contact.